We are located in a dense neighborhood with free street parking available. 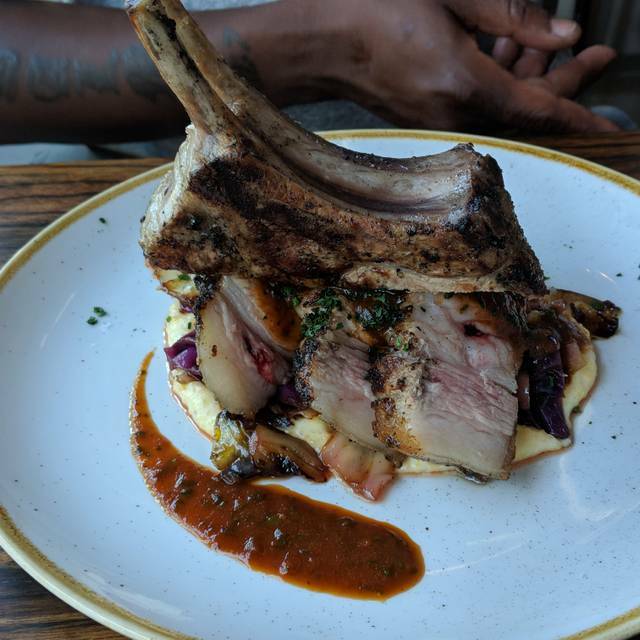 Flint Creek Cattle Company is a new American steak restaurant that emphasizes ethically raised beef and sustainable farm practices. The dining area is extremely wide open and spacious. There is a large, high vaulted ceiling in addition to floor-to-ceiling windows that lets in lots of natural light and lets guests feel like they are eating outside. 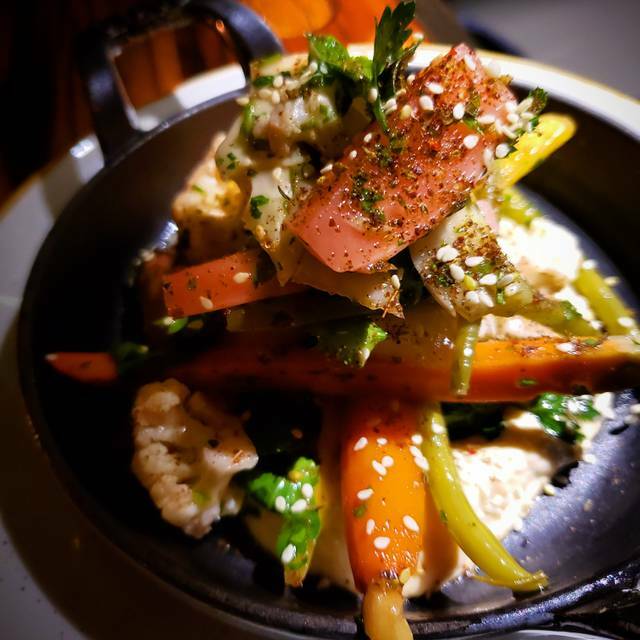 Flint Creek's menu is an ever rotating selection of modern American cuisine. The items on it frequently change based on the seasonality of the ingredients, ensuring new items are introduced as others leave. 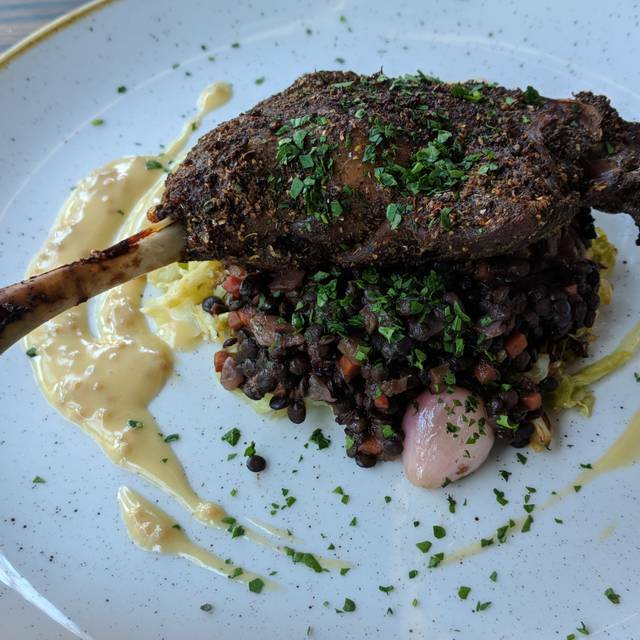 Favorites on the menu include Fennel Braised Wild Boar Shoulder, Durham Ranch Bison Hangar Steak, and the Oven Roasted Duck Confit. Overall our experience was good. The only problem was when I ordered a ribeye it actually came as a New York steak. I'm not sure if it was an accident or because they ran out of ribeye but nobody said anything. I ate the New York and it was quite good but we definitely enjoyed a good laugh about it at our table. food was served hot and cooked perfectly. menu was original but not bizarre, server explained menu items so we knew what we were getting. portions were adequate but not generous considering the price and location. service was very attentive, caution-this might not be the place if you want a private conversation, someone was filling full water glasses every few minutes. decor was nice although the chairs were uncomfortable. neighborhood was riddled with men aggressively pan handling, I work in downtown Seattle and this was more aggressive and candidly frightening. can't be good for business as this feels like an upscale neighborhood restaurant. We love this restaurant! The menu is always delicious, varied and interesting, and expertly prepared. We have been several times and have been delighted. From our recent dinner I heartily recommend the starter acorn squash, entrée of pepper crusted venison, the dessert with lemon. They have a very fun cocktail menu. Bon appétit! This was a great dinner. We were celebrating a special occasion, and so went kind of all out. Eery course was on-point--from the butternut squash/burrata first course to the flourless chocolate cake. I had the bison as a main course, and it was perfectly cooked with lots of layers of excellent flavors. Sweeties filet was stellar. Highly recommended. Brought guests from out of town here for dinner. Cocktails were very good, I especially liked the blazing saddles. We opted to share about half the starters and small plates rather than the chops. Nearly all were great. 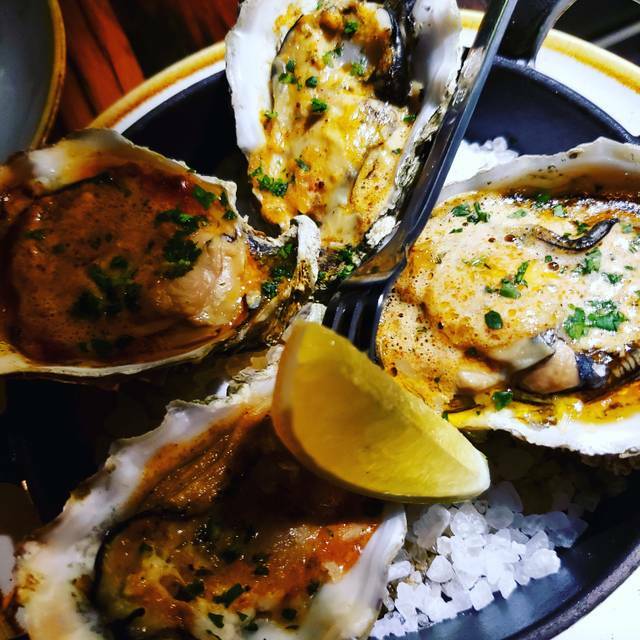 We especially liked the baked oysters, duck confit salad, and heirloom grits. Service was attentive and had great recommendations. Will be back. 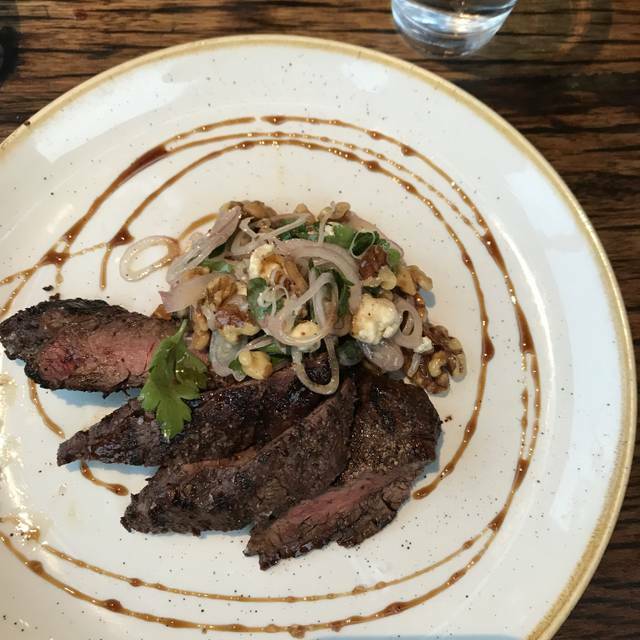 Service was excellent, environment was outstanding, and bison hanger steak was out of this world. Cannot recommend highly enough. Service was excellent, staff was friendly, food was excellent! We will be going back!! We called because we were delayed in traffic and they said no problem; when we arrived they seated us immediately and our server was so nice. We enjoyed everything about it. We ate “family style” and every single dish was fabulous. The staff was delightful. The bison, tuna and vegetarian pasta were loved by the guests. The lemon finish was award winning. The food is consistently good here. I bring my adult sons for steaks and my husband and I eat veggies. This last visit they mixed up the steak orders and some of the meat wasn’t eaten unfortunately. Shouldn’t happen in a restaurant with these prices. Also very noisy, they need to invest in some soundproofing. Excellent food and outstanding service. Such memorable food! 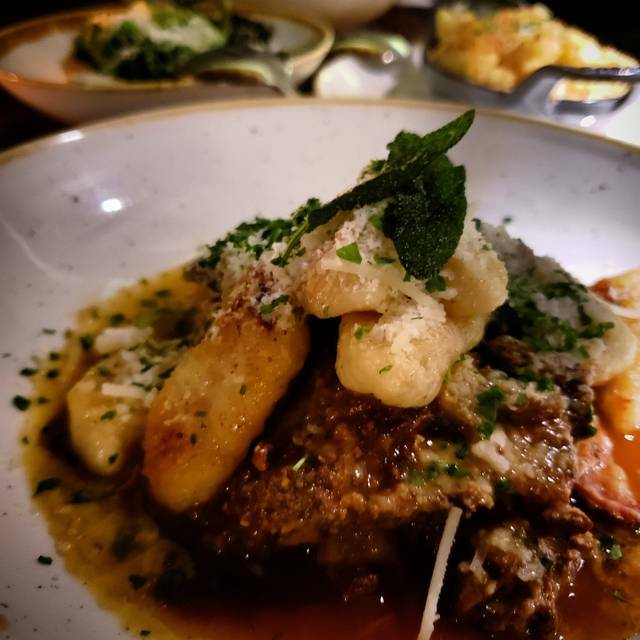 ordered the Wild Boar Ragu with potato gnocchi and it was fantastic. My son ordered the Wild Mushroom Bolognaise and it was rich and complex. Well worth a splurge dinner! came with a perfect, tender Swiss meringue that beautifully complemented the tart of the citrusy lemon curd. However, we went on a Saturday night and the two of us could barely hear each other across our tiny table. Unpleasant to have to almost shout over our lovely food. Amazing experience. Our waiter was amazing. We totally felt well taken care of but not over attended to. The food and service was excellent. The cocktails, particularly the one with the duck confit(! ), were executed amazingly well. A nice bit of the higher-end dining experience as the Greenwood neighborhood goes. Cheers FlintCreek! Great service, good food (although the bison was a bit bland), but way too noisy for conversation. The staff gave us the quietest table (upstairs) which was very nice of them, but man that place is loud! Too bad, because it's one of the best restaurants in the north end. So good! Food is always good, the space is beautiful and the service os effcient without being rushed. Highly recommend! Great food and cocktails- very informed staff! Meal was sooooo delish! Everything - from the eggplant starter, pickled vegetables & baby gem salads, up to moses lake pork chops & chicken entrees. Service was very good, and recommendations from our server were spot on. We will definitely be back. Very overpriced for what you get. Service was slow and forgot our starters. Luckily we weren't charged. All the food came at once with several servers which was nice. Steaks are underwhelming but sides were absolutely lovely. Corkage fee is $30. I don't know what the norm is but it felt high. The food was great with nice choices and stuff that is different from the average fare. Beautiful interior which is nicely done and nice restrooms. The staff was very friendly and waitstaff super knowledgeable and approachable ! Our experience was pleasant at FlintCreek. The composed dished seemed to vary greatly in portion size. Duck breast was underwhelmingly small, while the pork chop was one of the largest dishes i have ever seen. To see these two dishes next to each other for the same price is laughable. The flavors on both were great but i think the duck breast dish needs some work. Overall it was a nice evening but i prefer RockCreek hands down. The food was excellent, the cocktails were interesting and delicious. It seemed that the server was fairly uninterested in his job, but he did it adequately. Overall, we will be going back, but we may sit at the bar in the future or try to get a different server. Really, really noisy, impossible to have a conversation. 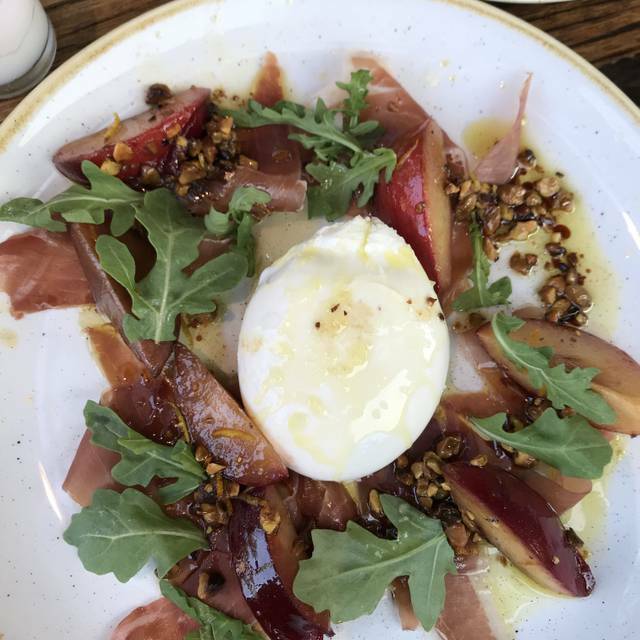 The food, though, was absolutely delicious, and the service was excellent. One of the best meals I've had recently. Traveled to Seattle on a whim from LA and decided to try this place... So happy I did. The BLT salad was phenomenal. I'm not a fan of bacon in general but this bacon was the king of bacons. I very much enjoyed the Durham Ranch Bison Hanger Steak as well. The combination of roasted walnuts with the cashew blue was quite delicious and the onion marmalade added a nice sweetness. Taste and quality go hand in hand and this place exceeds at both. Thank you Chef Erick for introducing yourself to this solo traveler and sharing your cuisine with me during this trip. I head back to LA - the land of foodies and quality dining completely satisfied. 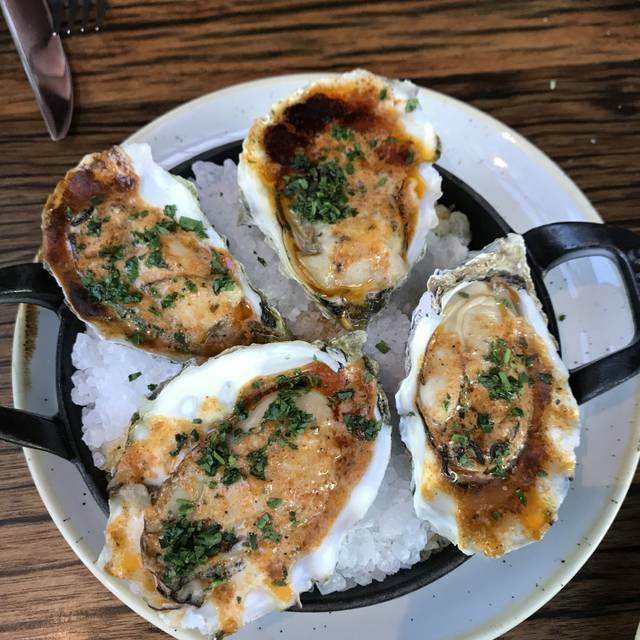 FlintCreek has a great atmosphere for a date with an exciting menu to accompany it, but the reality of it is that items are overpriced for the quality of the food. The highlight of the meal was the acorn squash appetizer. We ordered the lamb and bison steak -- didn't leave much of an impression. The brussel sprouts seemed undercooked and lacking in flavor. Sorry to say it, but the brussel sprouts at Whole Foods is 100x more flavorful! Regarding the service, the small details like missing utensils (no forks for the appetizer and having to wait for utensils after the entrees were delivered), then getting asked if we wanted the check when we were just served dessert felt rushed to us. There were several tables still seated at that point, so it didn't seem like a push for us to leave for closing hours -- probably just a premature gesture. At $147 for the meal for a party of two (and that's with only one person drinking), I'd expect a higher level of quality and attention to the details in food and service. Will close on a positive note and mention that the service was very friendly and the overall flow of when each course was served was well-paced. Fabulous dinner - if you enjoy steak and creative food, it is a wonderful place to dine! 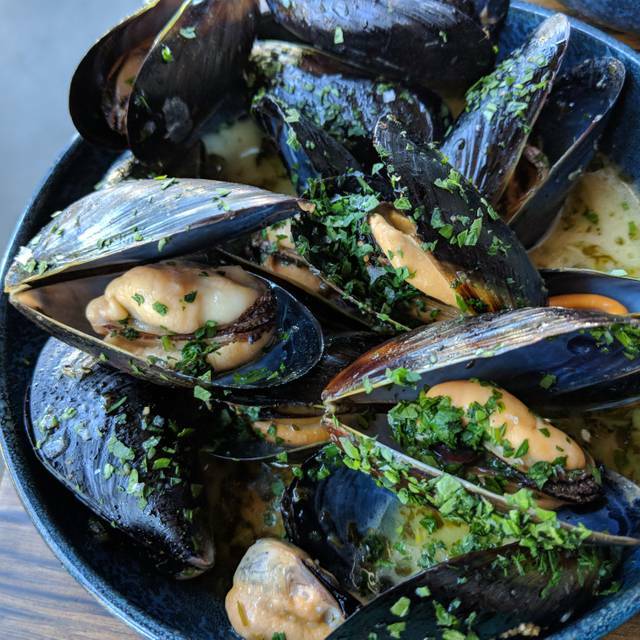 New in town and trying out the food scene in Seattle. Portions were just right but pricey. Food presentation was average. There were 5 of us - ordered the duck confit and duck breast, braised bison, pork chop, and venison. Some of the flavors got lost in the mix. 2 sauces served with the duck breast did not complement the meat. The cranberry sauce with the venison somewhat overwhelmed. Dessert was mediocre. Cocktail too sweet, not balanced. Wine list needs to be upgraded a bit. Good food, nice service. Uncomfortably loud and I like loud restaurants. Music speaker above table made it worse. Try the endive salad. You won't be sorry. I'm sure the desserts are equally wonderful, but after eating my great steak, I didn't have room! Next time. Had family in town and decided to go here. Food was delicious and the service was great. Pretty amazing to have a restaurant of this caliber so close by. They were very accommodating to little kids as well. See Full Restaurant ListMake a Reservation at FlintCreek Cattle Co.